Who doesn’t love meatballs? They’re easy to eat, fun to make and come in endless variation. Hell, there have been whole restaurants and cookbooks dedicated to the humble meatball. Königsberger klopse is a classic German recipe that uses several ingredients I don’t normally associate with German food: capers, anchovies and lemon zest. I found the recipe in Mimi Sheraton’s classic, The German Cookbook: A Complete Guide to Mastering Authentic German Cooking, which is to German food what Joy of Cooking is to traditional American food. Apparently this is a very common recipe in Germany. East Prussia, to be exact, where Königsberg once stood. The city was leveled in World War II. Afterwards, when the Russians took East Prussia, they renamed the city Kaliningrad. 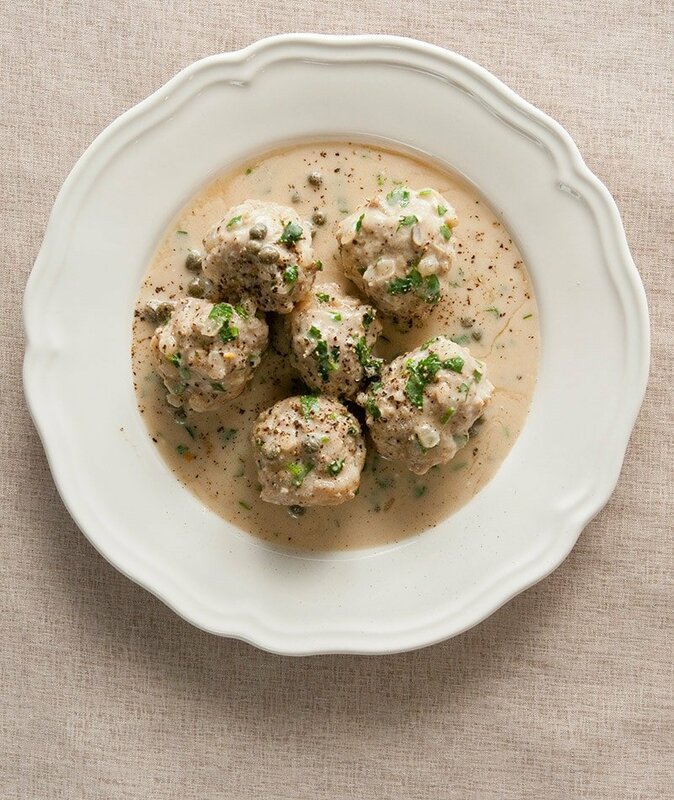 Historically, these meatballs are made from veal or pork. I made them twice: First with wild boar, given to me by a friend, and again using ground bear, sent to me by my father, whose friend in upstate New York wanted to see what I could do with bear meat. I also initially used bread soaked in milk and torn to pieces, as the original recipe does. But I didn’t care for the texture, so in the bear batch I went with breadcrumbs instead. Much better. Pronounced something like ker-nigs-burger klop-seh, these meatballs are a little unusual. For starters, they are not browned. You cook them in broth, very gently, and then use that broth to make a roux-thickened sauce studded with capers. Sour cream and parsley is mixed in at the end. I have no idea how capers and anchovies turned up in a German dish, but it sure is good. This is a comforting, mellow dish that has just enough zing in it from the capers, anchovies, lemon zest and sour cream to keep everything interesting. 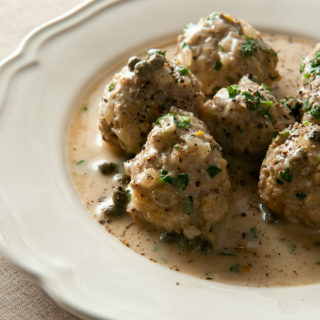 I normally use wild pig for these meatballs, but if you are not a hunter, go for ground veal -- if you can find humanely raised veal -- or ground pork. Heat the 2 tablespoons butter in a small frying pan and cook the cup of onions over medium heat until they are soft. Do not brown them. Sprinkle a little salt over the onions as they cook. When they are translucent and soft, remove from the pan and set aside to cool. Once the onions are cool, mix all the meatball ingredients together in a bowl. Form into small meatballs with a teaspoon. You can make them bigger, but a heaping teaspoon makes a nice size. Heat the broth in pot large enough to fit all your meatballs. A wide, deep saute pan with a lid is a good choice. Once the broth is simmering, turn the heat down to as low as it will go and add the meatballs carefully. If they're not all submerged in the broth it will be OK. Cover the pot and let the meatballs cook gently for 25 minutes. Carefully remove them and set them aside. Pour out the broth and save it. Wipe the pan with a paper towel and set it back on the heat. Add the 3 tablespoons butter and turn the heat to medium-high. Cook the onions until they're translucent. Don't brown them. Add the flour and mix well. Cook this over medium heat, stirring often, until everything is the color or coffee-with-cream. Add the hot broth a little at a time, stirring constantly. Keep adding it until you have a sauce the consistency of thin gravy -- not as thick as Thanksgiving gravy, not thin like soup. You probably will not need the whole quart. 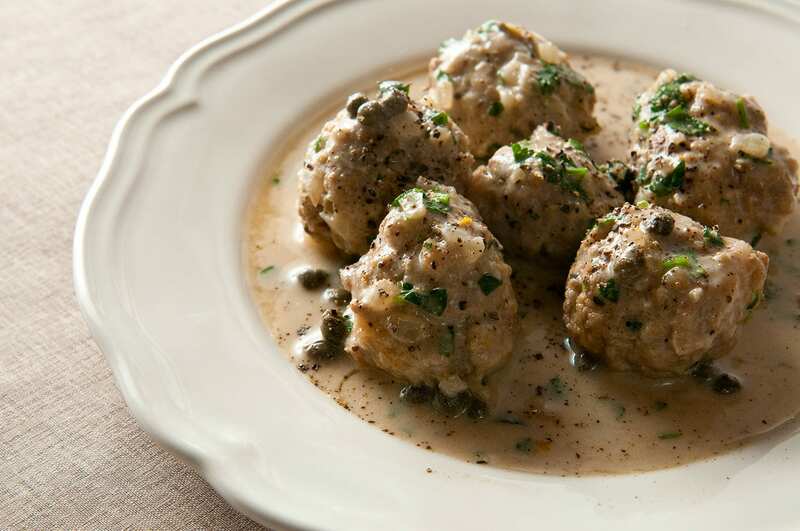 Return the meatballs to the sauce and add the capers. Heat through on low heat, then add the parsley. Serve with the sour cream at the table. Have people mix it in when they eat. This will prevent the cream from curdling and will let people make the dish as creamy as they want. Grind black pepper over everything and eat! Some old recipes for königsberger klopse just say to simmer the meatballs in salted water, but I prefer to use stock or broth. A tip: Do not let the meatballs simmer. Just get the broth to a simmer, carefully drop in the meatballs, cover the pot and turn the heat down to its lowest setting. The meatballs will cook gently, will not fall apart and will remain tender. Serve these with boiled or mashed potatoes or a good German bread. Like these meatballs? You’ll find other recipes for wild bigs, javelina and bear here on Hunter Angler Gardener Cook! I made this tonight with ground venison, no fat added. I was VERY HAPPY with the results. Simmering in broth kept these lean meatballs moist and I love the subtle flavor of these meatballs without the guilt of a lot of heavy ingredients. I would echo the comment above, for my taste, a slight bit more acid would do – though I think next time I’ll just serve lemon wedge with it and use a gentle squeeze on top after serving. Great recipe, it’s going in my personal cookbook after just one dinner, though that’s not entirely uncommon with recipes from this site, lol. Oh my goodness Hank! I am sure I broke some religious rules of cooking but I made this tonight. I did end up with ground boar from the market. And combined it with local beef and lamb. And I added the red wine and the blueberry plum jelly into the sauce and it was ridiculously yummy! Made a fennel, butternut squash and green tomato gratin for the side. I love this recipe I’ve made a few adjustments because I use it for my restaurant and when it’s a 10x batch you can chill on the strong ingredients like lemon zest and anchovy (I also use house made pork broth). Thank you so much for putting this out there. My husband was in the Navy one of our friends made meatballs like these with the gravy and combined them with Sauerkraut. It was fabulous! Have never been able to find a recipe .like it. I could have sworn it was called Feldeskraut, or something similar. Anyone ever heard of it or Seen a similar recipe? I am German. My mom always had a jar of capers in the fridge.